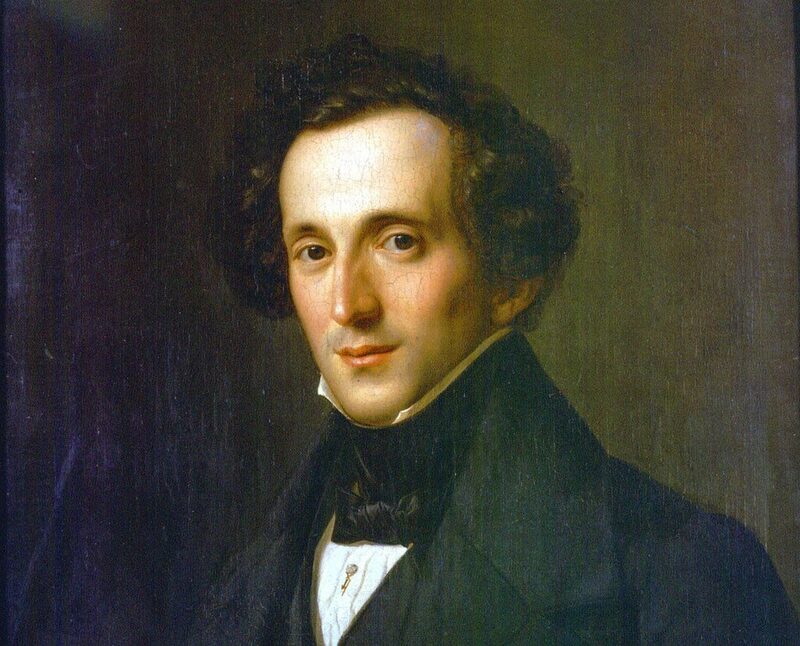 Felix Mendelssohn – quite handsome in his day. Felix Mendelssohn (last name sometimes hyphenated with “-Barthody”, a move done by his father to sidestep anti-Semitism), was a child prodigy, and the only composer comparable to Mozart in terms of his extraordinary abilities. He reached a level of creative maturity while still a child; he made his piano debut at age nine, and his composing debut at ten. He had the best music and theory teachers, and learned a great deal about Bach and how to write a fugue. By age 12 Felix had written some nine fugues (fugues are incredibly difficult to write – take the same melody in different voices, and layer it over itself several times over, without it sounding like a jumble), five symphonies for strings, two operas, and a trove of smaller pieces. As he grew into his adult years, he had one career success after another. Mendelssohn didn’t have the strongest constitution, and the death of his parents, then the unexpected passing of his beloved sister Fanny, caused him enough distress that he passed away at age 38, only two years older than Mozart at his time of death. As if he knew he’d have a short life, Mendelssohn made the most of his time on earth with his talent and work ethic; his outpouring of music, classical in style with an elegant touch of Romanticism, was astonishing. Most music fans know of his Violin Concerto in E minor, the Overture to Midsummer Night’s Dream, and his Songs Without Words for piano, but I find his Octet for Strings is generally lesser-known (though very well-known among musicians). This work is the pinnacle of chamber music craftsmanship. One reason there’s an excited air about the performance of this work is that there isn’t a standard 8-string ensemble for which to write chamber music. Meaning, there are string trios, piano trios, string quartets, chamber orchestras, but no standard ensemble of 8 string players, so often a group of soloists or two string quartets will get together at a chamber music festival and perform the Octet for Strings, which adds another layer of “zing” to the performance. I was enthralled the first time I heard this as a teenager at the Seattle Chamber Music Festival – the Octet made me wish I’d taken up violin (along with the piano). The last movement is a stunning fugue that builds relentless momentum, with hypnotic moments when all bows move in unison, playing a jagged theme at the same time. It peaks with “the dramatic high” (a lot like his Violin Concerto at its conclusion) and audiences always go wild with applause. If you ever see it programmed anywhere, buy tickets and go. Check out the Jasper String Quartet and the Juniper String Quartet. Felix Mendelssohn was born February 3, 1809 in Hamburg, Germany, and died November 4, 1847, in Leipzig. Robert Schumann was one of the pallbearers.